18+. New customers only. Minimum €20 deposit required. Bonus and deposit are subject to 6x wagering requirement, bets with minimum odds 1.80. Unused bonus expires within 60 days. Bonus needs to be requested within 7 days of registration. T&Cs apply. Bottom line An easy-to-use online betting site with great bonuses. Highly recommended for players who want the basics and nothing else. 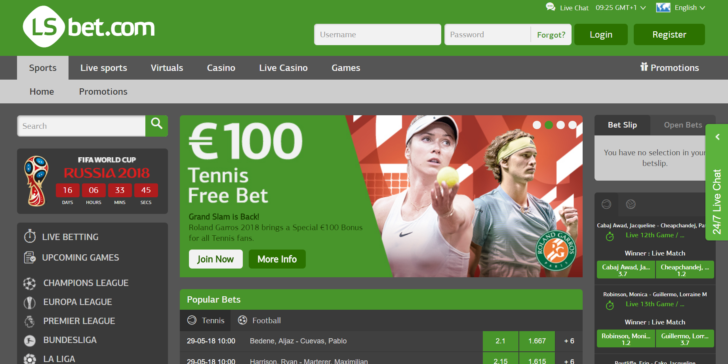 Following its establishment in 2012 LSbet Sportsbook has quickly secured its place on the online betting scene. The team behind the site comprises of experts who believe that they can do a better job than most of the bigger online bookmakers. That mission crystallizes in their commitment to players. The customer service is quick and always available, the site is secured with the most up-to-date security, and the content is as fresh as it gets. Overall, LSbet Soportsbook provides 40 bet-types, which is standard in the business. The number of offered live sport events can reach 4,500 at times. Once again that number might seem extremely high, but in reality, it is pretty much the average for a betting site. Unfortunately, the selection of events will not satisfy the needs of players who are looking for rarities. On the other hand, LSbet Sportsbook is one of the most convenient betting sites out there. The list of promotions at LSbet Sprostbook is tightly packed. There are special offers for the most popular sports, such as tennis, football, and basketball. From the more universal kind, you can enjoy free bets, risk-free multibets, weekly cash rewards, mobile bonuses, and special campaigns for major events like the Champions League, Premier League, La Liga, or Bundesliga. The first deposit bonus is 100% max. €120, which, in the current climate, is a better one. If you are frustrated with slow and complicated online betting sites and your betting is centered around the main sporting events, give LSbet Sportsbook a try! The bonuses are on point and customer service is always there to help. As necessary to provide the services and fulfil our obligations as detailed in our Terms of Service. For example we cannot provide the Services unless we collect, check and use your personal information. Where you have consented to the processing, which you can revoke at any time by contacting us directly. Where necessary to comply with our obligations under our gaming licence, to comply with anti-money laundering regulations and to provide the protections required for problem gambling. LSbet collects information that clearly identifies you and logs all your activity on our site against your personal account including all bets placed and winnings received, all payments and withdrawals from your account, some of your browsing history, your favourite bet types or games and communications you have with customer services by phone, email or live chat. We do not sell or make available to unrelated 3rd parties your personal data. Your data is stored for 3 years unless specifically required to be stored longer by our gaming licence regulations. You have the right to see what personal information we store for you. Please contact us directly to request a list of all your information stored and processed by us. We will respond to such requests within 30 days of receipt. Where you have self-excluded from our services we store this information indefinitely to ensure that you are no longer able to access the services without going through correct process. You have the right to withdraw consent to process your personal data at any time. Please contact us directly if you wish to withdraw your consent. You have the right to be “forgotten” and all your personal data destroyed. If you have self-excluded we will retain this information even if you have asked to be forgotten to ensure you are not able to gamble with us again as is required by our gaming licences. To ask to be “forgotten” please contact us directly. You have the right to lodge a complaint with the European Data Protection regulators. Such authority will expect that you have raised your concerns directly with us to try and resolve in a reasonable time period before escalating the matter. We collect your personal information on registration including your name, valid address with postcode, date of birth and email address. We also ask for further documentation to prove your identity including passport details, a photograph of you, recent utility bill and other related information. We use this to make sure we know who you are to comply with our gaming licence regulations and to comply with Anti Money Laundering legislation and in certain territories to provide support and protections for problem gambling. We check your personal information against industry specific databases as well as locally available databases to ensure that your personal information is correct. We process and store all details of your betting and gaming transactions in order to provide you with a safe, auditable gaming experience and to comply with our Gaming licence. When you make payments to your account we process your credit card, banking information or other payment details. We use third-party payment service providers and we do not store your credit card information. We monitor your bets and gameplay in order to comply with our gaming licence and potentially to provide you with problem gambling advice and support. We collect information from your browser, computer or mobile device, which provides us with technical information when you access or use the services. This technical information includes device and network information, cookies, log files and analytics information. We store your information provided during customer service interactions and from our live chat services. These allow us to ensure that we have the latest information on any queries, complaints or questions you may have had in the past to enable us to improve our service to you ongoing and solve any problems or complaints you may have raised. 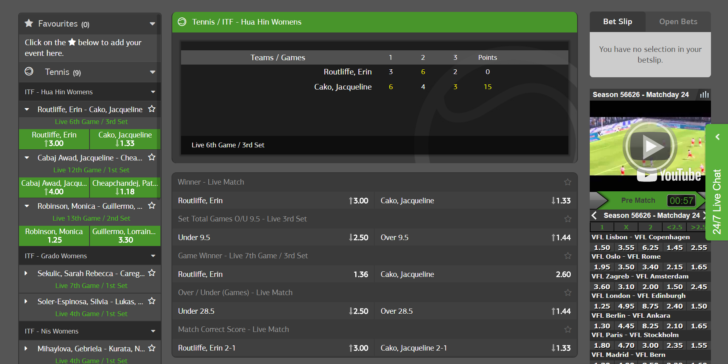 We profile your betting and gameplay in order to provide you an optimised service. This includes ensuring that you get the rewards that you deserve and that we send you the most relevant marketing communications where you have agreed to receive same. 3rd party CS Tools. Our livechat service is provided by a 3rd party that stores and processes your chat history. 3rd party Casino game providers. Casino providers see your betting activity and your account username but no further personal information. 3rd party Fraud tools. These tools see all of your entered personal information in order to check your registration and deposits and withdrawals against industry and other regulatory databases. 3rd party Marketing Tools. We use sophisticated marketing providers to ensure that we only communicate to you relevant promotions and to ensure we keep communications to sensible levels. Such 3rd party software is hosted by the providers who store your user name and your gaming history including all your bets on sports and casino games. To protect your account and to comply with our responsibilities for anti-money laundering we use 3rdparty fraud tools to monitor your deposits and withdrawals. When you use the Services, a cookie will be stored on your computer. Generally, cookies and similar technologies work by assigning to your browser or device a unique number that has no meaning outside of LSbet. We use these technologies to personalize your experience, including language and currency preferences and to assist in delivering content specific to your interests. Additionally, after you’ve entered your username and password during a session on the Services we save that information so you don’t have to re-enter it repeatedly during that session. This may be extended, where you have agreed to do so, for future automatic logins. Most browsers automatically accept cookies. To manage the collection of information through cookies or other equivalent technology you can use the settings on your browser or mobile device. LSbet is committed to providing you choices to manage your privacy and sharing however we do not recognize or respond to browser-initiated Do Not Track signals, as the internet industry has not fully developed Do Not Track standards, implementations and solutions. To learn more about Do Not Track signals, you can visit https://allaboutdnt.com. Not accepting cookies may make certain features of the Services unavailable to you. LSbet may also use your IP address to identify you, to administer the Services and to assist in diagnosing problems with our servers. Keeping our services safe and secure. We do so as it is necessary to pursue the legitimate interests of LSbet and its users in ensuring the Services are secure and to protect against fraud, abuse, money laundering, etc. We take several measures to safeguard the collection, transmission and storage of the data we collect. Although we strive to employ reasonable protections for your information that are appropriate to its sensitivity, we do not guarantee or warrant the security of the information that you share with us and we are not responsible for the theft, destruction, loss or inadvertent disclosure of your information or content. No system is 100% secure. LSbet uses industry standard Secure Sockets Layer (SSL) technology to allow for the encryption of your personal information and payment information. You should use an SSL-capable browser to reduce the risk of your data being intercepted. The services are registered with site identification authorities so that your browser can confirm LSbet’s identity before any personally identifiable information is sent. In addition, our secure servers protect this information using advanced firewall technology. While LSbet continues to work hard to protect your personal information, no data transmission over the Internet can be guaranteed to be absolutely secure, and LSbet cannot ensure or warrant the security of any information you transmit to us. Transmitting personal information is done at your own risk. Our site contains a small number of links to outside parties (such as problem gambling sites). These sites unless indicated do not belong to LSbet and we are not responsible for the Privacy Policies or practices these sites may provide. You should ensure that you have read and agreed to the privacy policies of all sites you visit from LSbet, such policies may differ from ours. You may correct, amend or update your account information on the site or by contacting us directly. Where you change your address or your Name we will require new documentation to be provided to support this change. We will generally respond to your requests within 7 business days. LSbet Sportsbook Advent Calendar Promo Offers Daily Prizes! Get €200 with This UEFA Nations League Deposit Promo at LSbet Sportsbook! As a registered LSbet.com player you can view all of your account transactions, bets in play and results at any time, under My Account. No. 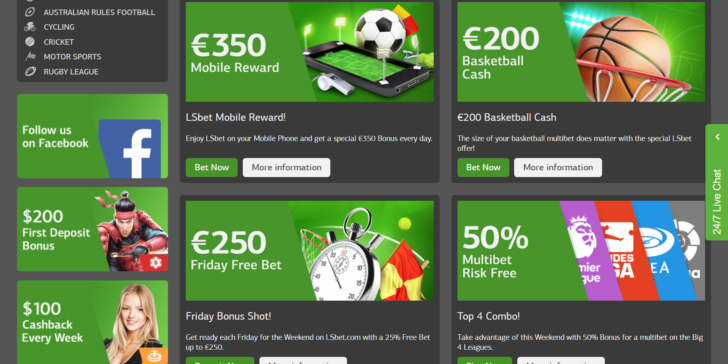 LSbet Sportsbook can be accessed from browsers only. Follow our Promotions and Bonuses to find out about the newest LSbet Sportsbook offers.